ظهر العملة لاعب هوكي يقوم برمية لولبية، وهناك صورة لأوراق القيقب على كلا الجانبين وعبارة "Vancouver Whistler 2010 9999 Fine Silver 1 oz Argent Pur"
لاعب هوكي يقوم برمية لولبية، وهناك صورة لأوراق القيقب على كلا الجانبين وعبارة "Vancouver Whistler 2010 9999 Fine Silver 1 oz Argent Pur"
1oz 2010 Canadian Olympic Hockey Silver Coin Minted by the Royal Canadian Mint in limited quantity and issued in 2010 commemorating the 2010 Vancouver Winter Olympics. This silver coin has a tiny mintage of only 79278 coins. This obverse coin carries the logo for the 2010 Vancouver Olympics - the official logo of the games (Inukshuk - a human built stone landmark used by the Inuit, Inupiat, Kalaallit, Yupik, and other peoples of the Arctic region of North America.) 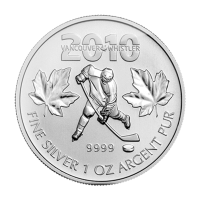 The reverse depicts a hockey player taking a slap shot with a maple leaf on either side. We only have a few of these, order them while you can!